The riot shield was created as a means of aiding law enforcement in containing and dispersing large crowds. Its designers were intent on creating a shield capable of combating a variety of scenarios and opted to use a special grade of durasteel, which is already an incredibly strong metal alloy, during production. 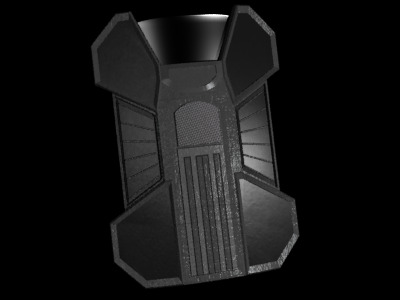 The results exceeded every expectation and riot shields quickly found widespread use with government and law enforcement agencies throughout the galaxy. Standard riot shield models are rectangular in shape and offer their wielders a protection zone between the upper leg and neck. The heavy durasteel frame is able to absorb physical impacts and dissipate moderate blaster fire, protecting the wielder from devastating injury. Some models include a transparisteel view port located on the upper portion of the shield to provide better visibility without sacrificing the much desired protection. One of the most commonly used tactics for the deployment of riot shields is to have a line of armed officers stack up directly behind the shield’s wielder, providing frontal protection while allowing direct forward movement. In some cases, an officer should wield a one-handed melee weapon or a small blaster in conjunction with the riot shield.